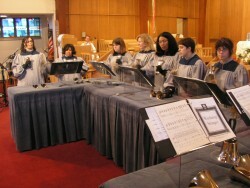 The Celebration Ringers utilize a 3-octave set of hand bells (3 octaves of hand chimes are also used). Some prior music reading experience or experience playing hand bells is required for membership. Play: On major festival days and periodically throughout the year.